A French Hail Storm, _ or _ Neptune losing sight of the Brest Fleet. London, H.G.Bohn, 1851. Etching, 315 x 360mm. Coloured. Trimmed from larger sheet, narrow margins. Admiral Howe was much criticised for staying in Torbay instead of blockading the French at Brest. 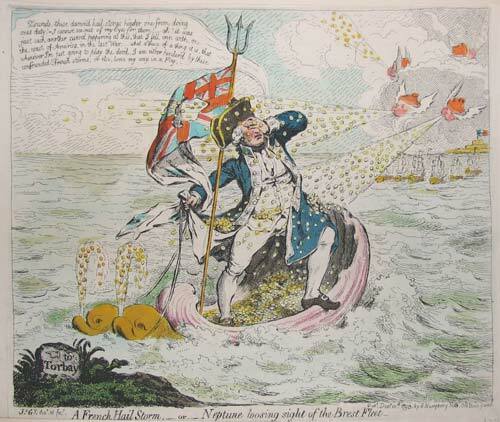 Here Gillray suggests that French money was responsible. Six months later the 'Glorious First of June' sea battle restored Howe's reputation. First published 1793.